The Best Second Life Blogs from thousands of Second Life blogs in our index using search and social metrics. We’ve carefully selected these websites because they are actively working to educate, inspire, and empower their readers with frequent updates and high-quality information. Also check out Top Second Life Youtube Channels list for Top videos on Second Life. About Blog Simply Fabulous Free and Under L$75 Finds in Second Life Since 2007. Facebook fans 1,694. Twitter followers 662. About Blog Find Second Life Freebies, Gifts, Promos, New Releases and so much more! Second Life's Nessaja finds all new quality items and keeps you up to date. Facebook fans 7,369. Twitter followers 638. UK About Blog As Inara Pey, I’ve been blogging about my SL times since the end of 2007. You’ll find a mix of news, reviews, commentary and opinions. Facebook fans n/a. Twitter followers 3,248. Seattle, WA About Blog Wendz Tempest is a Second Life blogger of all things Cozey for your virtual residence. Find the latest news in home, garden, decor and more in the Virtual World of Second Life. Facebook fans 757. Twitter followers 546. 5. Oh Look! It's A Blog! About Blog Random Second Life Things authored by Brandi Monroe. San Francisco, CA About Blog Find latest Second Life news updates and more from this community. This new platform will democratize VR as a creative medium and make it easy for people to create, share, and profit from their own social virtual experiences. Facebook fans 398,390. Twitter followers 52,234. San Francisco, CA About Blog A place to post and discuss everything relating to Linden Lab's Second Life. Facebook fans 1,188,126. Twitter followers 549,866. About Blog Keep up to date with the latest information on second life by Brent Lockhearst. About Blog I am a passionate and feisty fashionista extraordinaire who eats pixilated food and owns a killer shoe cupboard. That’s my SL sister’s description. I prefer to think that Alexa is the leading actress in her virtual fantasy world who spends the majority of her time shopping and creating scenes for the pictures that she shares on this blog. Athens, Greece About Blog My name is Exis and I’m a blogger for Secondlife. Find latest articles on Styling and Photography about Secondlife. Switzerland About Blog Angel Tzara is a fashion blogger and owner of the Definite Second Life Fashion Feeds. Find Your Second Life Family of Feeds. Facebook fans 84. Twitter followers 267. About Blog I am Adalynne Romano, a Secondlife Blogger and Photographer. I am a lively, charismatic, bubbly, spontaneous Gemini with a million random thoughts to share. I have a great passion and love for photography and blogging. I like to keep a balance of home decor and fashion blogging as both hold a special place in my heart. Facebook fans 292. Twitter followers 379. About Blog My name is Starr Ghost and will just say that I am not a professional writer just one that likes to chat it up about stuff, also with me on this journey of Second Life is my bestie Dena Teardrop. Recently we made the decision to stop doing fashion. This blog is about stuff, like decor for inside or out, throwing things together giving you some idea on decorating again as we are not professionals but with our two brains we just might make this work. About Blog This blog represents my fascination by fashion and photography in SL. About Blog Hello Second Life blogging world!! We are twin sisters who are obsessed with fashion, photography, poses, events and destinations in the amazing Second Life world. We decided to start this blog together to share all the things we love so much about our SL. About Blog Alexa's Fantasy Wardrobe is a second life blog where I post everything from my every day wardrobe to home and garden decor. About Blog Keep up to date with the latest information on Second Life. Life and travels in a Virtual garden. About Blog Designing Worlds is the hit weekly show on design and designers in virtual worlds, broadcast every week by Treet TV, the leading TV network in today’s virtual environments. Designing Worlds is presented by Saffia Widdershins, the Editor of Prim Perfect Magazine, and Elrik Merlin of Radio Riel. About Blog Hello, welcome and thank you for visiting my blog. My name is Roxaane Fyanucci. I'm a professional french model-stylist-blogger-artist in Second Life. No matter where you are and what you look like. Create your own style.Let it be unique for yourself and yet identifiable for others. The creation begins deep by yourself. Be inspired in my world and give your life an extra boost. So show yourself more and just be you. About Blog Cheyenne Palisades' musings and speculations about her experience with Linden Lab's Second Life. About Blog I am a Second Life Photographer. You can find me in Second Life as Sadwolf. About Blog I’m Samantha Hellmann and I’m an addict to decorating and Second Life. I hope you’ll find some inspiration some cool stuff and have fun! About Blog Wretch blog for second life, kemono, mesh. Wretch creates Semi Exclusive full perm meshes for Second Life. With minimum sell price, to guarantee competitive prices between you and others designers. 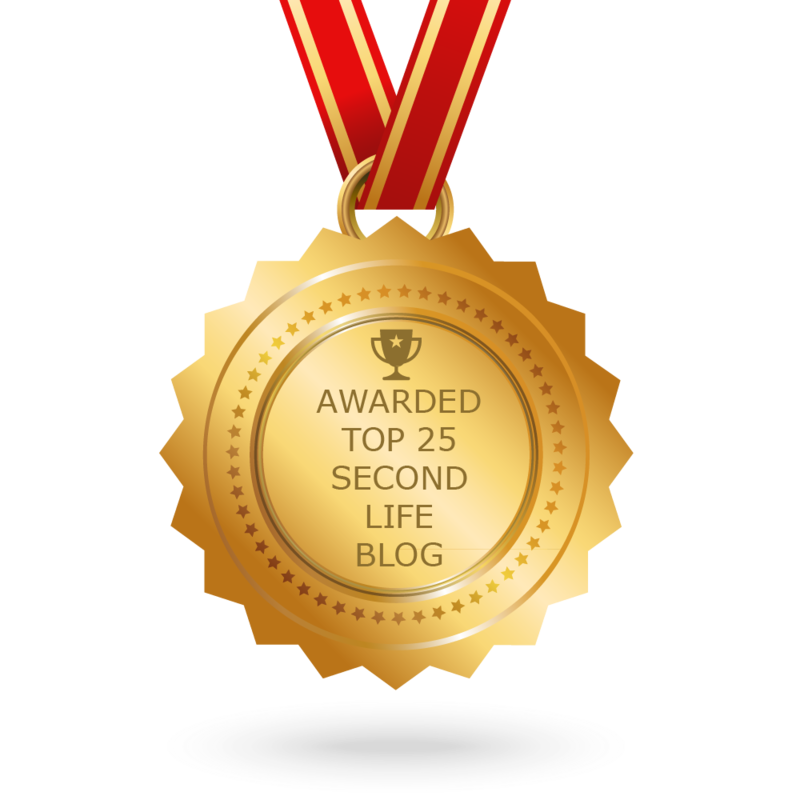 CONGRATULATIONS to every blogger that has made this Top Second Life Blogs list! This is the most comprehensive list of best Second Life blogs on the internet and I’m honoured to have you as part of this! I personally give you a high-five and want to thank you for your contribution to this world.